Ouroboros Signaling Probe: Keep control of your network! Signaling Probe: Keep control of your network! Ouroboros Turnkey Probe solution provides Operators and Regulatory Authorities with the ability to fight Revenue Loss, enhance Quality of Service or deploy innovative services such as SMS Welcome/Goodbye or Missed Call. 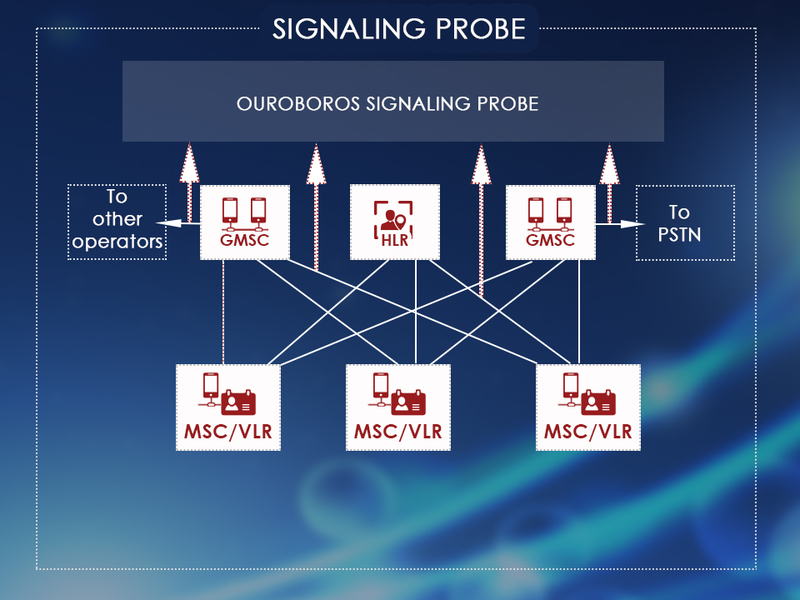 Our probe solution will work with both SS7 TDM and SIGTRAN networks, without affecting the network behaviour, by converting the signaling of calls into XDRs that can be reused by Value Added Services, Anti-Fraud Systems, etc. provided by third-parties. # Perfect complementary solution to SIM-box detectors. # Local Number Portability Deployement assistance. # SS7 or SIGTRAN connectivity. # 100% Non-intrusive, undetectable probing system. # Ability to generate Call Detail Records in custom formats. Ouroboros provides Mobile Core technologies, expertises and products for Operators and Partners around the world.